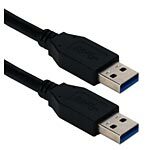 This cable connects your computer to any USB device with Type A female port. Works with development boards that uses USB Type-A female ports including JTAG programming modules. It is USB 3.0/3.1 GEN1 compliant, shielded to reduce electrical interference, molded connectors with strain relief for added flexibility and supports speeds up to 5Gbps.